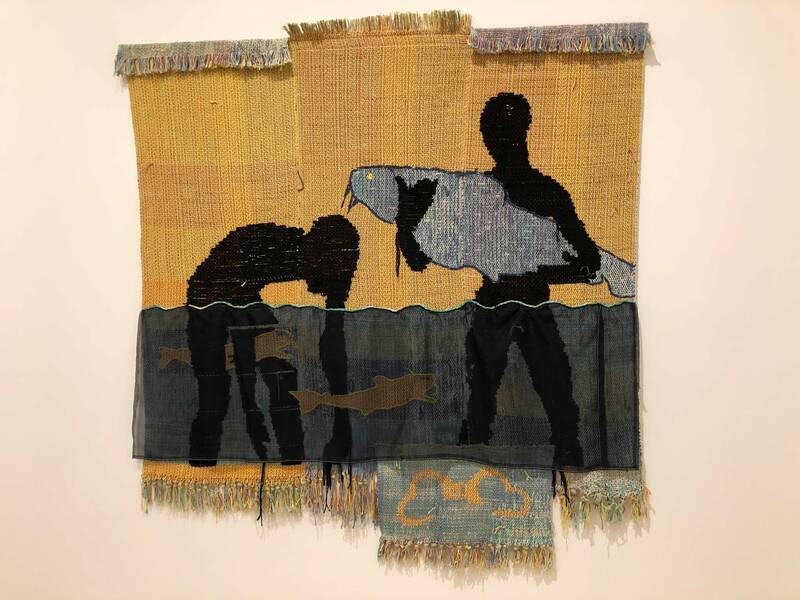 Thoughtfully employing the language of weaving and textile making, Diedrick Brackens explores the intersections of identity and sociopolitical issues in the United States. 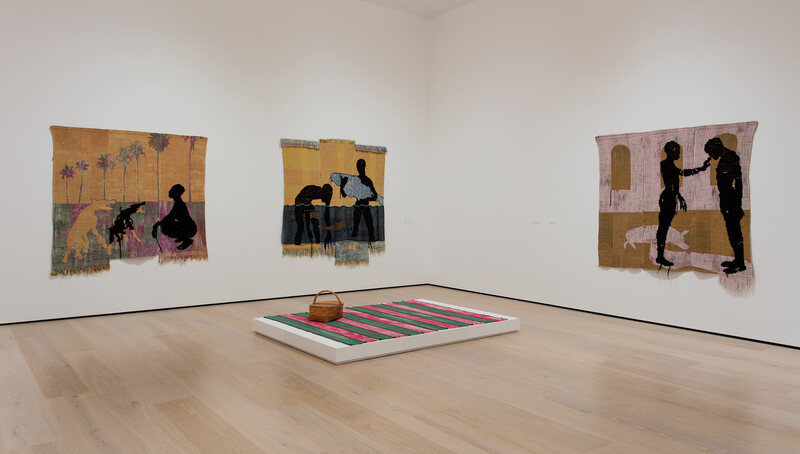 Brackens uses calculated woven algorithms that stem from the cultural histories of African, American, and European textiles to generate his intricate tapestries, seeking to highlight the complexities of African-American identity while also focusing on the loom and its significance to cultural production. Meditating on larger cultural and familial narratives of his childhood in Mexia, Texas, Brackens has created three large-scale wall tapestries that feature scenes centered on man and animal and are informed by the artist’s relationship to masculinity. Structured like a play in three acts, each piece features silhouetted figures who find themselves rooted in seemingly disparate narratives that, upon closer inspection, build upon each other. For example, bitter attendance, down jubilee is based on a real-life event that took place during a Juneteenth celebration on a lake near Brackens’s hometown, before he was born. Three young black men were arrested for possession of marijuana and loaded onto a boat by the police. The boat capsized and the young men, who could not free themselves from their handcuffs, drowned. The police were brought to trial but were acquitted, and the tragic event has had a lasting effect on the community, tainting its relationship with the lake and heightening racial tensions. In his tapestry, Brackens represents the young men as large catfish circling and being embraced by the black figures, as a pair of golden handcuffs looms in the foreground. These pieces serve as bridges between reality and memory, allowing new modes of myth-making to come forth. Diedrick Brackens (b. 1989, Mexia, Texas) works in the Leimert Park neighborhood of Los Angeles. Brackens received his BFA from University of North Texas, in 2011, and MFA in textiles from California College of the Arts, in 2014. His work has been shown in solo exhibitions at Ulrich Museum of Art, Wichita (2017); Steve Turner Gallery, Los Angeles (2016); and Johansson Projects, Oakland (2015). Group exhibitions include SOMArts, San Francisco (2014); Berkeley Art Museum (2014); 3rd Ghetto Biennale, Port-au-Prince, Haiti (2013); and Museum of Geometric Art, Dallas (2011). Brackens is a recipient of the Barclay Simpson Award from the California College of the Arts (2014) and Clare Hart DeGolyer Memorial Fund (2011).